We have been living in apartments for the past year, with the exceptions of some travels where we rented a few houses with outdoor space. We spent as much time as possible in the many amazing parks while in Prague, but sometimes its just not the same as being home and being outside. So, while I know our year of city life and travels around Europe have been enriching for all of us and just what we needed at the time; and, that the girls would have benefited in some ways from attending school here in Italy. (language, confidence in making friends, mind broadening activities, and independence from me). I think that instinctively what they need now for awhile, is freedom in a safe outdoor space where they can create, explore and not be shushed. I think we are also a little tired of packing up and the effort it takes to get out to the park. How nice it is to just put shoes on and head out for a change. Brooke has a said a few times that she missed Big Bear, CA and Prague. I ask what she misses... "In Big Bear she misses our house and one section of our property where a cluster of boulders and fallen trees came to be called her fort. In Prague she misses Monkey Tree Park, as we came to call a park near our place where there were trees that were perfect for climbing. (We gave our own names to all the parks we went to since we never could remember or pronounce the Czech names for them.) Not any of the amazing playgrounds, architecture, classes, or any other experiences; but a place where she felt she could create an outdoor sanctuary and be free to be a monkey:) This really surprised me, that of all things these places were what stood out to her. For about the same cost as our apartment in Prague, this house on the border of Tuscany and Umbria is beautiful and I think its just what we all needed, a place where we can get a little more space between us and they can be outside and be as loud as they want. Funny thing is, they haven't been loud here in the open outdoors, they seem peaceful. "I know sweetie, we'll go outside soon..." says my little mama. They have been so busy! Brooke especially loves it, she can't wait to "get gardening" as she says. Savannah too, was intent on planting something. "I have my tools and am ready to get gardening!" Brooke picked tiny flowers for Savannah as we walked. She'd say, "Oh, I can't believe it!" We talked about different plants, trees, irrigation. Mom, look what I found! Eating 'rainbow oranges' - half orange, half blood red, so yum! "Ooh, good, see..."Collin's comments about many new discoveries. Usually its stomping in puddles that really makes him excited. In thinking about how to make the most of these experiences and make them "more educational," I'm looking to my Reggio methodology. First of all, I am loving this new focus on my end. Really listening to everything they say and putting everything they do in a new, more important light. It makes it all more fun and it allows me to enjoy the moment too. The "Wonder of Learning" is not teaching, telling them what to do, and how to do it. 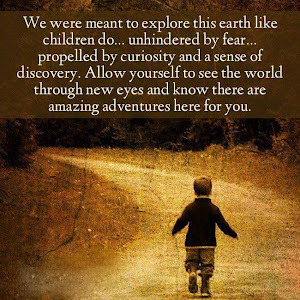 But, letting the discovery inspire them to want to know more. So, I am thinking about how to ask the right questions... I am not an overly controlling person and I really don't know a lot about gardening, but even so I find myself correcting what they do, "oh, it doesn't need more water... I think we should do it this way." I am recognizing this and trying. Brooke brought home some new flower seeds from the store. I made a conscious effort to help without instructing and it worked! I became her assistant. We walked around and she chose a plot of land. She wanted me to help hoe the ground. I wanted to give all sorts of instructions but I stayed quiet and tried to think of good questions. She first complimented me on how well I hoed, thank you very much...haha. She then started dropping seeds in, but got frustrated at the thought of not knowing where they were going to be and that they would get mixed up with the vegetables she planned on adding. After some thought and (just a little help from me), she made dividers using nearby stones and bamboo sticks to separate the sections. She was very pleased with it and I actually really enjoyed our time gardening together too. Brooke, "Do you want to play mom and baby? You be the baby and I'll drive..."
thyme, rosemary, and parsley right outside. I am so glad I'm finding the motivation and focus to document our experiences in this way. Seeing the world through their eyes and taking a little more time to enjoy and remember every moment with my little sweets. "It is increasingly necessary today to speak in ways of seeing, the see-er as well as the seen, i.e. the relationship between who sees and what is seen, a relationship which is increasingly interdependent. "